Kids, Cows and Grass: Too early for a beer? Too early for a beer? This morning my husband was making coffee when I cracked open my first beer. He didn't even flinch. But when I opened the second one, he turned around with a strange look on his face! 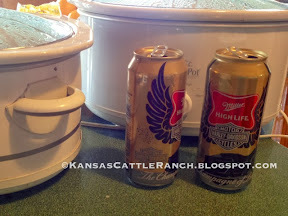 Then he watched me pour them into a crockpot with a beef arm roast and knew we are in for some good eating later! A favorite recipe of my kids is one of the easiest! I got it from my famously awesome cook sister Amy. Even though that doesn't sound like good grammar, it doesn't matter. Because she is an awesome cook and sister! Here it is: toss a roast in the crockpot--any beef roast. I use an arm roast or chuck roast mostly but any will work. Open a can of Campbell's French onion soup, pour it on top. Crack open a beer--any beer you are willing to part with--and pour it around the sides. Turn crockpot to low and cook all day! When you get back in the house in the evening, the smell will make your mouth water! Just shred the meat, tossing the fat into the trash and saving the bone for Roo the cowdog. Serve on a toasted roll with provolone cheese and give each diner a bowl of the juices for dipping! Wow!! Delicious cold weather food, perfect for my family! My husband will also insist on some horseradish sauce. Okay by me!! We are planning a big weekend of bringing cows home from the pasture where they have been all summer. We are preparing for winter. My parents are coming from their ranch 45 miles away to help. With three generations working together, we are planning fun, food and lots of good, hard work! Everything a ranch is made of! 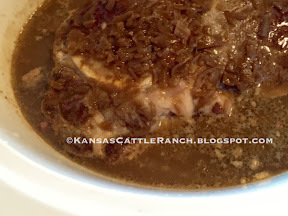 Have a great weekend and let me know if you try Amy's French dip roast! Oh, I have to try this one! It sounds so simple and so delicious. And my picky-eater husband loves roast beef that falls apart. Thanks for the inspiration. Enjoy your family and this wonderful meal. May use this recipe myself for Wednesday night before Thanksgiving when everyone has arrived for the holiday!